(Central Islip, N.Y., March 27, 2018) – The Long Island Ducks today announced the signings of outfielder Tyler Holt and catcher Wilkin Castillo. Both players will begin their first season with the Ducks. 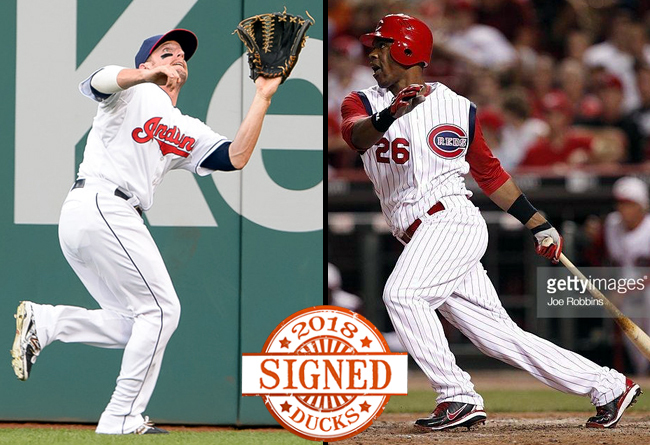 Holt joins the Ducks with 156 games of Major League experience, spread over three seasons with the Cleveland Indians and Cincinnati Reds (2014-16). He totaled 15 RBI, 29 runs, 64 hits, seven doubles, three triples and seven stolen bases at the game’s highest level. The Indiana native made his MLB debut on July 6, 2014 against the Kansas City Royals and recorded his first big league hit on August 13 that same year with a single off Arizona Diamondbacks pitcher Vidal Nuno. The 29-year-old was previously named an MiLB.com Organization All-Star with the Indians in 2014. He combined to play 98 games with Double-A Akron and Triple-A Columbus, batting .305 with 30 RBI, 74 runs, 107 hits, 19 doubles, 31 stolen bases and a .406 on-base percentage. The eight-year pro also earned International League Mid-Season All-Star honors in 2015 with Columbus. He spent 2017 in the Los Angeles Dodgers organization with Double-A Tulsa and Triple-A Oklahoma City. The Florida State University alum boasts a .994 career fielding percentage in the Majors and a .987 fielding percentage in the minors. Holt was originally drafted by the Indians in the 10th round of the 2010 amateur draft. Castillo comes to Long Island after spending parts of two seasons in the Majors with the Reds (2008-09). He combined to post a .314 batting average over 22 games, registering 11 hits in 35 at-bats. The Dominican Republic native made his MLB debut on September 2, 2008 against the Pittsburgh Pirates and earned his first Major League hit a day later with a pinch hit single off Pirates pitcher T.J. Beam. The 14-year pro previously earned Southern League Mid-Season and Post-Season All-Star honors in 2007 with Double-A Mobile in the Diamondbacks organization. He accrued a .302 batting average that year with six homers, 46 RBI, 50 runs, 124 hits, 31 doubles and 18 stolen bases in 109 games. The 33-year-old played in the New York Yankees organization during the 2017 campaign with Double-A Trenton and Triple-A Scranton/Wilkes-Barre. He has thrown out 36 percent of base stealers in his minor league career while simultaneously posting a .987 fielding percentage. Castillo was originally signed as an undrafted free agent by the Diamondbacks in 2003.